*This information is calculated based on your shipping location. All orders are shipped via FedEx. Shipping prices are calculated based on the artwork location and your shipping address and include insurance. Handling prices apply on a per work basis and include packaging costs. The quoted shipping windows reflect proper preparation and packaging time. Once items ship, transit time will vary depending on your location. If your country is not listed, please contact Collector Services to discuss your order. Tax is calculated based on the artwork location and your shipping address. For orders shipped within the United States, sales tax is only charged for New York State shipping addresses. Duties and taxes are added to orders shipped internationally based on the current country rates. 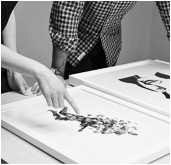 Artspace offers professional framing on Artspace Editions and select artworks as indicated on the artwork detail pages. To discuss framing options on other works, please contact Collector Services. Artspace frames are crafted from archival materials with wooden mold, UV Plexi, and custom-cut matting. Framed artworks arrive wired and ready to hang. All Artspace Editions are returnable within 30 days of your purchase. Artworks purchased from one of our gallery, museum, or institutional partners are final sale and not returnable, as indicated on the artwork detail pages, except in the case of damage. Questions about your order or about our policies? Email service@artspace.com and we will be happy to assist you. Copyright © 2019 Artspace Marketplace, Inc.
Log in to your account to complete your order. Create an account to complete your order. This item is sold out and will be removed from your cart when you continue to checkout.